Argument and Don't Walk Chairs | OhGizmo! The XXL Chair, The Future of Furniture? Just two chairs, found at Urbancharm. 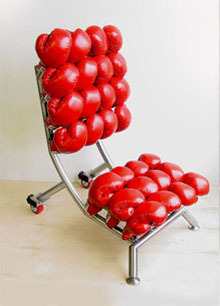 The first one is called “The Argument” chair and is made entirely of boxing gloves. It seems it will soon be featured on NBC’s “The Contender”. It goes for $5900. 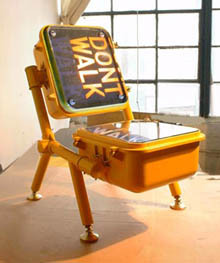 The second one is called the “Don’t Walk” chair and is made from working New York City signs, mounted on a custom modified metal frame with galvanized self adjusting feet. The signs actually still work and you can adjust the flash speed. There’s no word on price. Instead, you’re invited to call. Update: The Don’t Walk chair is $2,700 from Uncommongoods. Thanks Jen. “Don’t Walk” goes for $2700 via Uncommon Goods.